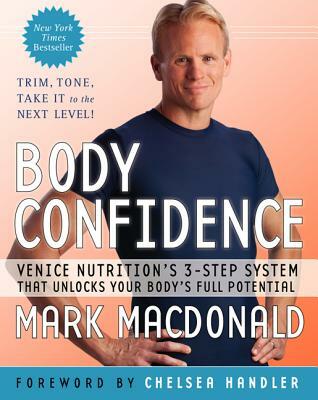 Say goodbye to feeling disappointed with your body—Body Confidence is the highly anticipated fitness book from world-renowned Venice Nutrition Program founder Mark Macdonald. Macdonald’s targeted series of diet and fitness strategies are proven to burn body fat, boost energy levels, increase muscle mass, and eliminate sugar cravings for a better looking, better feeling body today. Providing a step up to holistic body care for fans of Tosca Reno’s Eat-Clean Diet or Jorge Cruise’s Belly Fat Cure, and an excellent companion to Cynthia Sass’s Cinch!, the Venice Nutrition Program’s innovative fitness plan focuses on blood sugar stabilization and a complementary program of exercise, sleep, and stress management. A foreword by bestselling author Chelsea Handler will let you know why Body Confidence is your next step to a healthier, happier tomorrow. Mark Macdonald is the creator of the Venice Nutrition Program. He opened the first Venice Nutrition Consulting Center in Venice Beach, California, over fifteen years ago, and it has since developed into a network of more than five hundred centers across the United States, Canada, and Europe. He is the go-to health expert for both CNN and HLN, and he hosts the Daily Share segment Transformation Tuesday on HLN. Mark is the author of the New York Times bestseller Body Confidence: Venice Nutrition's 3-Step System That Unlocks Your Body's Full Potential. Mark is also married to the love of his life, Abbi, and they are the proud parents of their son, Hunter, and baby girl, Hope.